This is part 2 of 4 of the Insane Quick Tips series, where I share bite-sized tips that will exponentially grow your blog business. Pin me, my dear friend? I’m sure you’ve heard of BuzzSumo, an incredible market research tool. 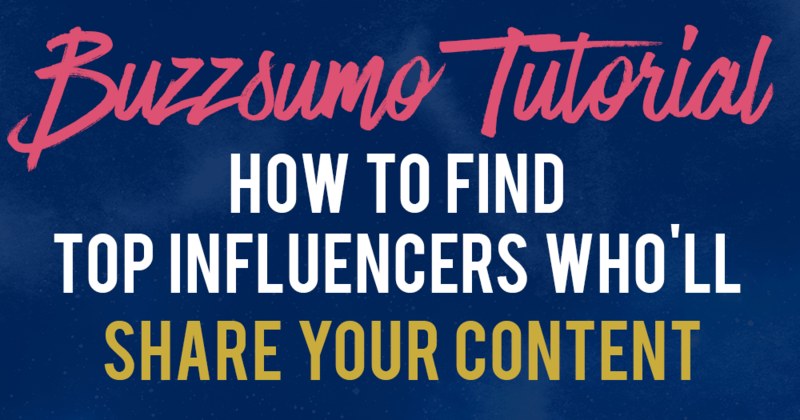 Buzzsumo helps you to 1) find the most popular articles for a certain keyword, 2) discover popular pages of any website and even 3) helps you to find influencers that are almost guaranteed to share your content. I’ll talk about all 3 in this post. Without further ado, let’s get started. 1. 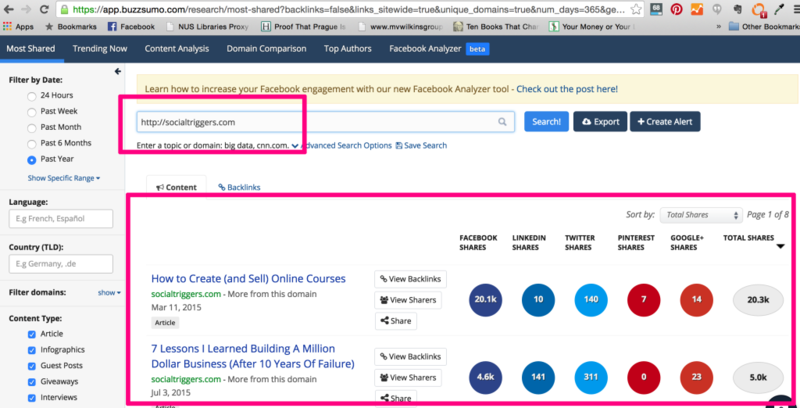 Using Buzzsumo to Find the Most Popular Articles in Your Niche, for a Given Keyword. This can potentially help you to discover good blog post or freebie ideas. For example, if I’m offering something about list building, BuzzSumo will help me to look for the stuff that has the most shares with my keyword (“list building”) in the past year. By the way, you’ll also love my tutorial on how you can get more subscribers with your current blog traffic. 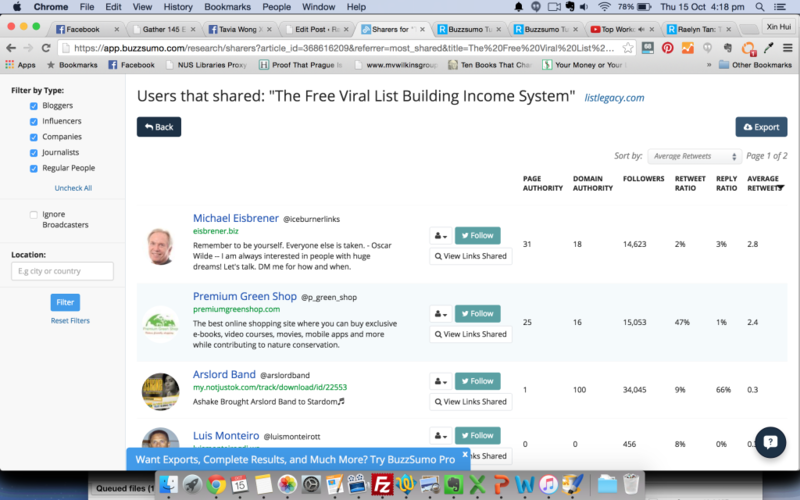 If I type in “list building” in the search bar, you can see that there’s this “free viral list building income system” that’s been getting a lot of social media engagement. You can see what are popular stuff revolving around particular topics that have occurred recently. What this helps you to do also is that you can create compelling headlines that have been proven to work. You also get additional ideas about what to offer or write about that have been proven to be popular. You can do this for any keyword, for example, “lose weight” or lose “belly fat.” You can see the stuff that people are sharing. Our aim now is to find the best-performing articles that you (or your competitors, hehe) have. For example, we can search for socialtriggers.com, a popular marketing blog. Over here you can see the stuff that Derek Halpern has posted in the past year, and how many social shares it has. You can look at people in the same industry and see what has been performing really well for them, and then create something that’s similar or better. If I just created something related to my list building mini course, over here if I click on “view sharers” for this entry, you can see all the people who’ve shared this particular post that is similar to what you are creating. You can sort by how many followers they have or how much influence they have. Then you can contact the people that are the most influential and tell them about this new thing that you have going on, and hopefully, they will share it for you. It’s an excellent research tool for you to find out what’s what’s trending as well as to spy on your competitors. 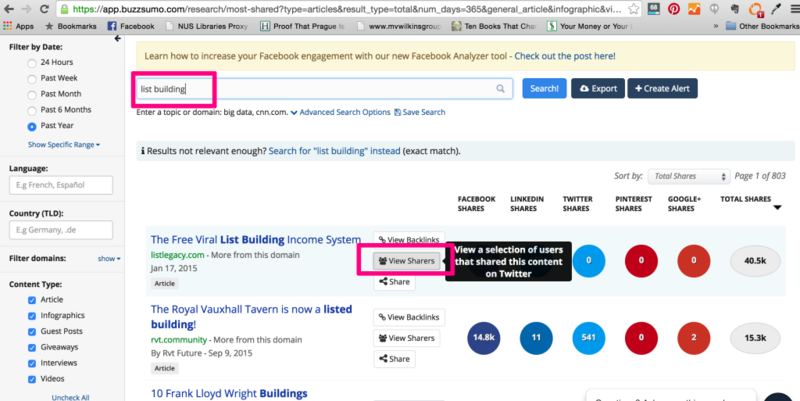 Do give Buzzsumo a try because it’s a really good research tool to create content and really good enticing opt-in offers. 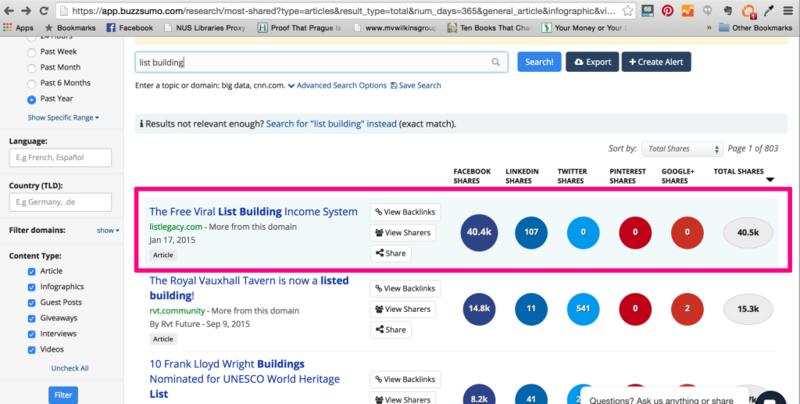 You can even use Buzzsumo to generate good headlines for your content, free offers, free webinars, etc. This, in turn, would allow you to build a blog/ brand that stands out from the crowd. Oh, and also to spy on people in the same industry and see what’s working for them. So yeah! Take care and bye! Thank you for the great review on BuzzSumo it was very helpful.